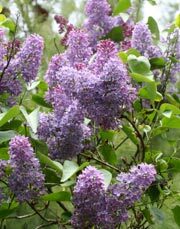 There are approximately 20 different species of lilac shrubs. Lilacs are not native to North America, but are native to Europe and Asia. Lilacs have been highly hybridized and selected to produce an estimated 1600 different named varieties to choose from. Lilacs range in size from large shrubs to small trees. 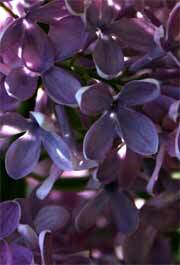 Lilacs do best in neutral to alkaline soil that is moist, but well drained. They are quite adaptable to soil conditions and don't require any special soil additives. They do best in open areas where they have full sun and good air circulation. They can take partial shade. They do better in cool, dry climates where mildew doesn't mar the summer foliage. All lilacs make good specimen shrubs or used in masses, against buildings or in shrub borders. In humid regions, lilacs are prone to develop powdery mildew which will coat the leaves with a white powder, but won't kill the plant. More serious concerns are blights which appear as brown blotches on the foliage. This can be prevented by pruning to provide good air circulation and keeping pruning tools sterile. They can also be treated with a spray of Bordeaux mix. Scale and lilac borers that look much like a asp are the most common insect pests. Lilac stems should be pruned out in winter so they don't rub against each other. Once blooms are completed, remove dead flowers to prevent seed formation. When rejuvenating older plants, you can remove up to 1/3 of the oldest stems each year. The more new growth you can encourage, the more flowers you’ll have in the future. Next years flowers formed on this year's branches, so pruning should be carefully considered and done early in the season. Lilacs should not be planted too deep. The surface of the soil ball should be level with the surrounding ground. Dig a hole the same depth as the root ball, but a little wider to allow for straightening of the plant. This allows the soil to be back filled with no air pockets. Firm it in hard. Water it in well. Make sure the soil settles around the root system.